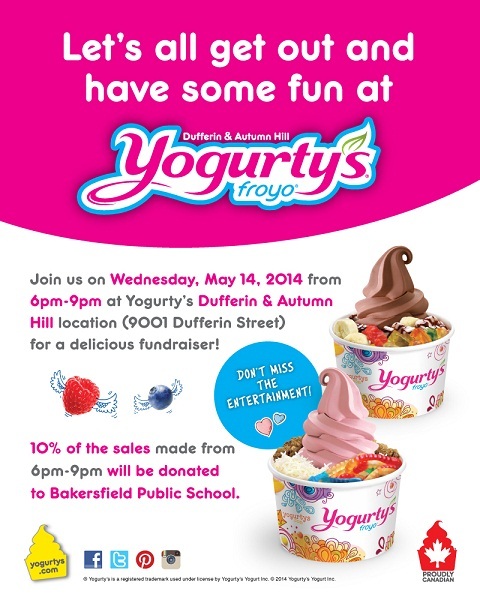 We wanted to share a reminder with our community about School Council’s upcoming event at Yogurty’s (corner of Dufferin and Autumn Hill) on Wednesday, May 14, 2014 from 6:00 p.m. to 9:00 p.m. There will be a D.J., face painting and a raffle … and of course, delicious frozen yogurt! There is no cost to attend the event, and a portion of any food sales from the evening also goes to the school, so please consider coming out to enjoy an evening together. All are welcome!